Washing of artificial stone looks very impressive and aesthetically, it is pleasant to the sight and touch. This car has other advantages. But is it really a good artificial stone to use? Not to be mistaken with a choice of sinks, you should be aware not only of the inherent advantages, but also disadvantages. Manufacturers of sinks offer the consumer products of artificial stone in a wide range. It is considered that the washing of artificial stone have a high reliability due to homogeneous structure of the material. Being resistant to household liquids, such washing may, in respect to last quite a long time without changing its appearance. However, the appearance of the product to determine its quality can be very difficult. Not all existing on the market the manufacturing companies provide high quality sinks made of artificial stone. To make the right choice, you should have an idea about the features of the process of manufacture of such products and know what drawbacks they have. Companies manufacturing sinks made of artificial stone, often actively promote their products, with an emphasis on the virtues of their product. In most cases, manufacturers give the correct information, but still prefer to remain silent about the features of the car washes that do not allow them to fully compete with products from other materials. The main drawback of stone sinks is a relatively high price. Budget the option of washing at all desire can not be called. Artificial stone loses against the prices of alternative materials, among which the most popular are stainless steel and granite. Very often, the sinks are made of acrylic stone. This polymer material consists of small mineral particles, acrylic resin and coloring pigment. The main drawback of sink from acrylic stone is that it is quite easily scratched. Particularly sensitive to such mechanical stress uniform in color glossy materials. When choosing a sink made of acrylic stone best left side in chocolate, dark grey, black and other dark colors. Scratches that appeared on a sink, will be very evident. The significance of the described disadvantage will decrease, picking up an acrylic wash of beige and grey shades. Best of all, if the stone will have inclusions, rich texture and grainy pattern, similar in texture to natural marble. The second "minus" acrylic sinks is that they are poorly resistant to high temperatures. In other words, if you put in a unit for some time a hot pot, it may appear clearly visible spot. Manufacturers of acrylic washes to assure that in the event of such trouble the wash can be directly on the spot being simple restoration without disassembling the product. At the same spots, scuffs or scratches disappear, and the sink looks like new. Yet even such a cosmetic treatment washing requires time, effort and additional financial costs. Agglomerated stone called, which contains in its composition a significant part of natural minerals, such as marble, quartz or granite. To improve consumer properties of such artificial stone add sand and glass particles, fine quartz sand and coloring pigments. The common basis of such acts of polyester resin. Washing of sinter have higher strength when compared with acrylic products. Agglomerated stone, unfortunately, is less plastic than acrylic materials. Therefore, if you purchase a too complex shape, you run the risk over time to obtain a deformation in the form of microscopic cracks. Of course, they are almost impossible to distinguish by eye, but essentially on the sink are formed by seams. Each such seam may cause more severe deformation in the form of "full" cracks or chipping of the material. In particular, increase the probability that the temperature changes when exposed to the wash water. In addition, the agglomerates are a very heavy dense material. It is very difficult to handle and install. And abrasive substances sink, agglomerated stone more afraid than acrylic. If the surface is glossy, then after prolonged use it may develop tiny scratches. Even if the functionality of the sink is not affected, the appearance of the product will not be new and sparkling. If you decide to subject the agglomerate of restoration, you should know that polishing of this artificial stone requires special equipment and is very time consuming. To return this sink to the original luster, you'll need to attract professionals. C the right kind of solid surface sink your kitchen will have — aesthetics, originality and long lasting functionality. That is why it is so important not to be mistaken with a choice. You must take into account all your wishes and existing features. High quality material — the most significant advantage of sinks made of artificial stone. According to international standards in the composition of the artificial stone should be 80% of the chips of natural stone and 20% of auxiliary materials. Note this line, as this is the key to durability of the kitchen sink. To enhance competitiveness, some well-known manufacturers have developed special formulations of porcelain tiles. It can be on the Teflon, which gives a special dirt repellent, triclosan, and even the silver ions to protect against bacteria. For the proper choice of sinks made of artificial stone take into account the size of your kitchen. Also important is the future location of the sink relative to the surrounding objects. This will depend on its shape. Angular and shallow models may be preferred if the kitchen is small. If you have spacious kitchen, you can easily choose among the sinks of various shapes and depths, including models with multiple bowls, and adjacent surfaces. With the latter you will give the impression of a single image space. This option is preferred, if your house love to cook. 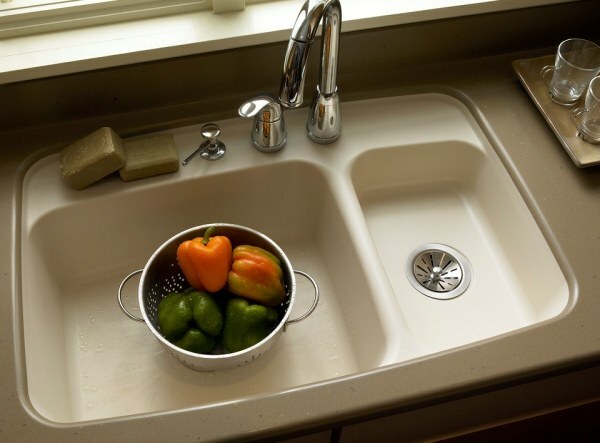 In the deep sink is convenient to put the vegetables to defrost something, to wash the dishes. On the adjacent plane, it is possible to place any utensils. Do not forget about the color scheme of your kitchen. Washing of artificial stone should fit into the overall interior. Some prefer to choose the sink in tone, and some opposite — playing on the contrast. Expensive copies of high quality are too diverse, original and exclusive. Washing of artificial stone in different ways to install. They are mortise and overhead. The latter is easier to install, they simply overlap, as other working surfaces. This option is more suitable in that case, if your furniture is represented by a set of individual modules. For installation of the kitchen sink with single top choose inset sink. A novelty of mortise models of artificial stone steel integrated sinks. They form a perfect transition sink in the work surface. 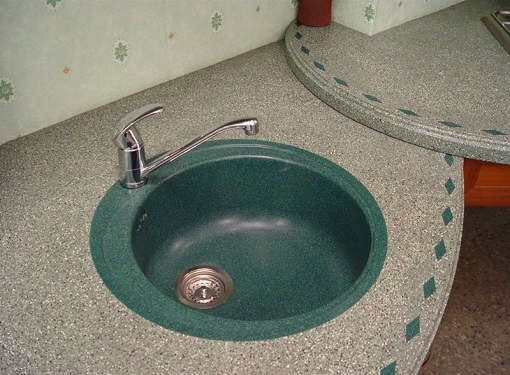 It is important to consider that the chosen sink was in one color with the countertop. Be careful and note the best depth! Too deep bowl sinks made of artificial stone can be very convenient for you. For wide models, sometimes just to pick up the mixer with the desired length of the spout.